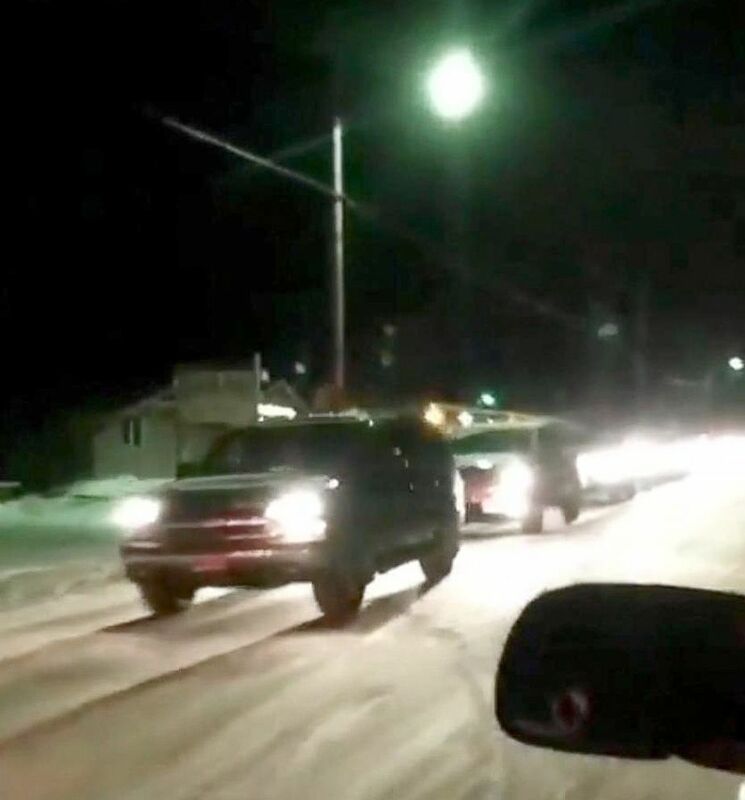 A 7.9 magnitude earthquake rattled the southern coast of Alaska early Tuesday and initially triggered fears of a tsunami in Hawaii and along the West Coast. 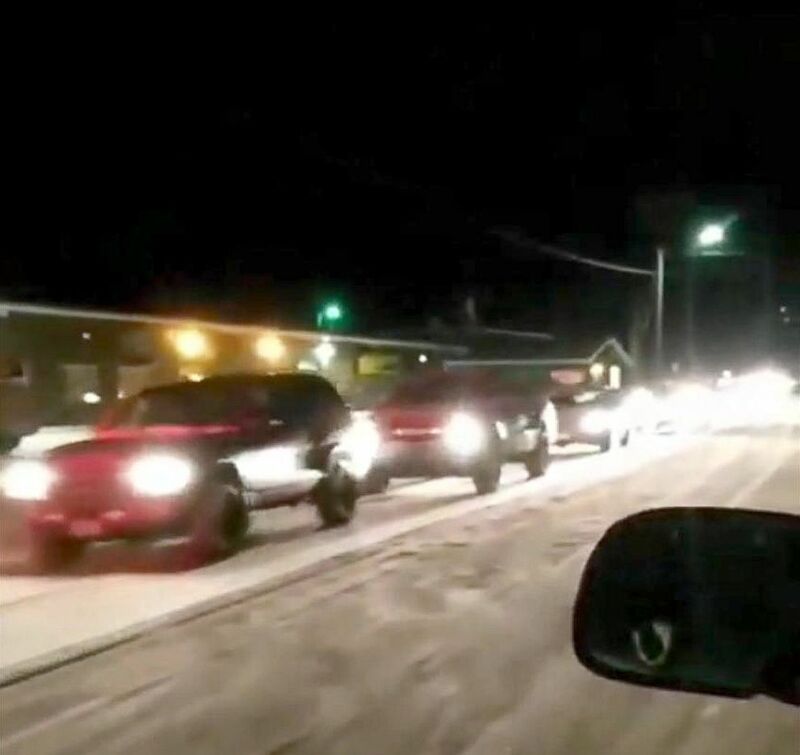 Cars evacuate Kodiak, Alaska, Jan. 23, 2018, after an earthquake struck off the coast. The earthquake happened just after 1 a.m. local time about 175 miles south of Kodiak, Alaska. Residents of Kodiak were asked by police to move at least 100 feet above ground as a precaution. "I know that I was awake and the house started to shake and it went on and on, which is not normal for the kind of earthquakes I've experienced in Alaska. Normally they're short and this was long," Larry LeDoux, superintendent of the Kodiak Island Borough School District, told ABC's "Good Morning America." He said 500 to 600 evacuees initially sought shelter in the high school gym. "We opened all of our schools as shelters when we've gotten an alert," LeDrox said, adding that the high school shelter was full of children and elderly people. He described the atmosphere as "very relaxed." "In 1964 our beloved town, Kodiak, was hit hard by a tsunami and there are some people that went through that," LeDrox said. "I recognize a number of people sitting here who were here in '64, but, you know, tsunamis are part of our life and have sirens tested every Wednesday. We drill our students once a month." Another Alaskan resident shared a video on Twitter, where he was on a fishing boat in Kodiak. He described hearing sirens. Around 4 a.m. local time, officials canceled tsunami warnings for coastal areas of South Alaska, the Alaska Peninsula and the Aleutian Islands. Warnings were also called off for Hawaii and the Oregon, Washington, British Columbia and California coasts. Tsunami warnings were later canceled in other parts of South Alaska and the Alaska Peninsula, specifically the coastal areas from Hinchinbrook Island, about 90 miles east of Seward, to Chignik, Alaska. Tsunami warnings were issued for Alaska and British Columbia, with watches as far south as California, on Jan. 23, 2018. There were no reports of damage from the initial quake. The US Geological Survey said the earthquake was located in an area south of where the Pacific tectonic plate converges with the North America plate and at a depth of about 12 miles. Will Yeck, a research geophysicist for USGA, told ABC News there have been at least 30 aftershocks from the initial quake, the largest being a magnitude 5.3. Yeck described the event as a "strike-slip earthquake," meaning two large blocks of land horizontally move as opposed to vertically. "It's good news in terms of there was less vertical displacement," he said, explaining that vertical shaking generally prompts a higher chance of a tsunami materializing. He said the quake occurred on a fault within the Pacific plate that had not been previously charted. "The area that ruptured is approximately 230 kilometers by 30 kilometers wide," or roughly 140-by-30 miles, Yeck said. He also said it was fortunate that the earthquake occurred far from shore, dramatically reducing the chance of onshore damage. "As far as I know, I haven't seen any reports of damage," Yeck said. By comparison, a 9.2 magnitude earthquake that caused widespread destruction and death in Alaska in 1964, the second largest quake ever recorded in the world, occurred over an area measuring 155 miles wide by 500 miles long. The epicenter was about 12 miles north of Prince William Sound, and 75 miles from Anchorage, the state's largest city. 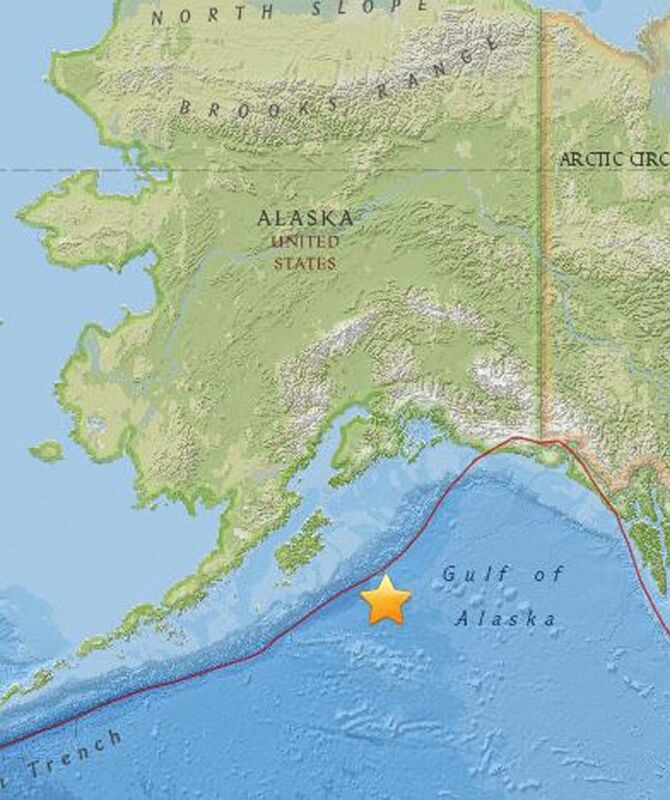 Yeck said it's not uncommon for large earthquakes to strike Alaska, citing a 7.9 magnitude quake that hit Central Alaska in 2002 and another 7.9 rattler that occurred in the Gulf of Alaska in 1987. A map shows the location of a magnitude 8.2 earthquake off south east of the city of Kodiak, Alaska, Jan. 23, 2018. 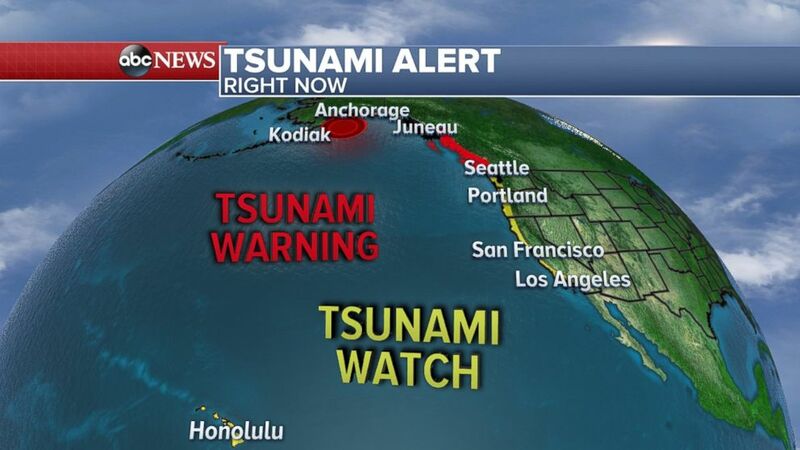 A tsunami warning has been issued for the Hawaii, as well as the entire west coast of the U.S.